THURSDAY 21st AUGUST, sunny, windy. @ the lucha meet hex. Two elves, two dwarves, two humans, a human / nisha, a lucha, and a dog. Off into the mountains to seek the long forgotten Great South Road. Conveniently, also puts me right at the new moon! E13 F13 G14 H15 (camp at White Oak). e13 - f13 2EP, 1 to cross river. Nothing happens. g14 - new hex, 2EP. nothing happens. This still looks very much like island mage territory to you. Eagles still about periodically. While in g14 you find the remains of the old road leading straight back towards the island lake, and also, straight on towards the white oak and beyond. h15 - white oak. the road continues, straight to white oak. You can't actually see white oak. All you find is the remains of an old cleared area about half the size of a soccer field, with an ancient stone fence going about it in a few places. 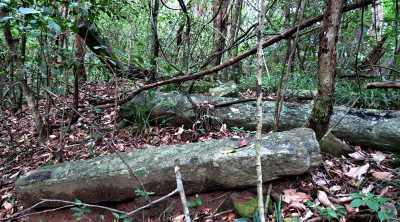 A few larger monolith stones remain, mostly fallen. 'There,' says Abigall, pointing into the trees, past the monoliths. 'White Oak. Isn't she beautiful? You camp at white oak. Nothing happens in the night. The scouts can eat free, as can the dog and the mouse. There's good food around here. Whoops! The original path was set before I got the "avoid this area" instructions. I would have set a different path to avoid it, since I'm trying to be kind to the evil necromancer who is secretly plotting to take over the world from his island fortress. I have extra EP too. The plan for tonight is to spend more time exploring in the White Oak hex and 1EP in the other hexes, though if I blaze a different route I'll have less time in White Oak. "Oak? Dere's no more oak dere no more." says Kilian. The rest of the party looks equally confused. "Abigall, take me to where you see the White Oak, close enough where you can touch it." Tiana is curious and would love for Abigall to teach her how to see it. Freya will follow. Kilian thinks that the mouse has been dipping into too much mead and will study the monoliths, pointing out engineering details to Bruce if he's interested. Talin, with little else to do, will set up camp. I'm trying to play nice and have one PC and one NPC at watch the entire time, which almost led to a really interesting pairing of Kilian and Abigall. Darkvision characters get the wee hours of the night and vision-impaired humans get the ends of the watch. Incidently, can Abigall speak enough common where she and Kilian can communicate basic topics (like, "look over there" ?). Also, how much sleep does Fido need? Abigall - no common, at all. Except that Sylvan and Brant have some relation - about the same degree as Welsh and English. So if you think you can speak Welsh, you're fine. Extra EP - sorry, no. Kilian is wearing scale mail and has a max move of 6. (I've decided not to average that out across the party.) Unless you plan on leaving him behind, you all still have 6. Or, he has to specify when he's wearing it. The faster characters can look around on their own while he is at base camp, but he can't ever move more than 6 in that stuff. The mouse takes Tiana right up to the place where the old oak supposedly is and...she can't even feel it. 'How odd,' says Abigall. She can run right up the thing. It's about 150' high and very gnarly, apparently. It looks like Abigall is floating in midair. A few of you explore the rest of the hex and find nothing. Fido sleeps on and off in the night. He is considered to be always ready when something happens. Like I said, nothing happens overnight. You all feel very safe here. It is now the morning of Fri 22 Aug, and threatening ore rain. Autumn is here and Bruce is complaining about the cold. You can reset your course now the eagle note stuff has been established. Where are you headed? By extra, I meant the first day's move was only 4EP to the last hex, having 3EP for the White Oak hex. Route could have been D13, E14, F14, G14, H14 (two EP not three). I'm backloading the extra EP for the end of the day, where I'm trying to finish in an "interesting" hex. Kilian will spend the time talking about how great it is to be in scale armor and how once underground, all the brambles and branches and rivers won't be slowing him down anymore. Just out of curiosity, Tiana takes one step further. Does Abigall think she is standing in the oak, or does she bump into an invisible oak, or does nothing happen? I'm expecting the latter but always good to check. "Oh!" exclaims Tiana, while studying the map. The others come over to her. "Look," she says while pointing at the map. "Red Oak, White Oak, Lone Island, even Widow's Peak. All in a line. And if you look at them closely, all equidistant too. There's probably something around here as well." She points at I16. "Abigall, do you know what's in this area of the woods?" she asks. You probably knew that months ago, but I just figured it out! Tiana and Freya will try to teach some common to Abigall. I'll swap Freya and Tiana in the watch order so Abigall has someone to communicate with. And while I never mentioned it explicitly, Talin will return the hairpin to Anna and claim his reward. He'll also explain the magic that it has. Using the hairpin and Roddy, Tiana will explain how she hopes Roddy is just curious and Abigall isn't as handsy with others' possessions. The party will willingly share food, treasure, and so forth; but outright theft is severely frowned upon. Most especially, she warns Abigall to never steal gold from a dwarf. Surely the Cruthy have childrens' stories involving stealing from dwarves. If not, she'll make something up. PS How many Americans speak Welsh, or for that matter, anything but a bastardized form of English? I'll get you started soon on the next day. It's always best to specify how many EP you are spending in each hex otherwise I might assume it is 2, unless you have been in the hex before. Also rivers are 1 to cross, no matter if you have crossed them before. Tiana reaches out to touch the tree and can't feel it. From Abigall's perspective she is standing in the oak, but the oak is kinda shimmery, so it is as though Tiana is in a different world to it. Abigall gets her first taste of common. Plus a stern lecture involving THE NAUGHTY LITTLE GIRL AND THE DWARF WITH EYES IN THE BACK OF HIS HEAD. Abigall says "Oh yes, the old road to the Peak. A good place. Our legends say it went to the Red Oak at one time as well, but that is gone now. And it goes all the way to the peak, a sacred place. I do not know what is there now, but before, there was the lake with the salmon of wisdom, and he would answer your questions, if you were pure of heart. But maybe that is just a legend. Our people never go up that far. But I do not understand about this I16. That hex isn't on the line you are talking about! Anyway, I don't know of any other thing, between White Oak and the Old Bridge." I'll get you started in the morning soon. Your route looks like 1 per hex except in the castle. Is that right? I know, I didn't mention the "all extra EP goes to the unexplored hex" thought. Sorry. I also forgot about the 1EP penalty to cross rivers. Is that major rivers or all? I was thinking Anna's reward could be +1 on her morale. What were you thinking?! You're correct on the route. Back into the wilderness! Fun times! BTW, why is Jane tagging along? I know why I want to keep an eye on her, especially when close to the towns, but what's her motivation for coming along? And when you have a chance, can Abigall share her life story? It's definitely new and different to the rest of the party, and Tiana is very interested to know. Kilian is curious about Bruce's story too, but assumes that because he's a city dwarf, it's boring and unadventurous. Anna's morale is unchanged by the incident. And I wasn't thinking anything! Jane, as you know from talking to her, is tagging along because she can't really go back to civilization, and you told her that if she comes in here alone, gumps will eat her. She believed you. She's as panicky as a kitten. She's also hoping you will find a way to cure her, at Cogan, somehow. The new day begins...Fri Aug 22nd and threatening rain. I15: 1 EP, following the old road. No encounters. J14: still going pretty fast, 1EP. No encounters after you leave the road. As you walk, Abigall tells you her life story on request, and it isn't much. Born about 25 years ago. Found out she was no good at magic, not like some of the others, of whom she is evidently jealous. Asked if she wanted to go and live among the humans for a while to gain some experience of that world, said no because she decided she didn't like the smell. Figured her life was going to be pretty dull til you showed up and she jumped at the chance to go with you. K15: Despite your speed, Talin comes across the tracks of some goblins, on wolves, heading north from this hex into K14. Quite recent (like, yesterday). It looks like 2 worgs with 2 goblins on foot. Could be more goblins, riding on the wolves. The trails have come form K16 (Fort Leavesworth). Bruce was just getting started on his life story when this happens. Everyone tells him to shut up. There is no smoke or any sign of anything at the castle. You have also found no gump tracks this side of the middle swell, which takes no EP to cross. Do you go on and spend 2EP at the castle, or do you investigate the footprints? Talin reasons that with a day's head start, the worgs will be long ahead of the party. Castle it is!